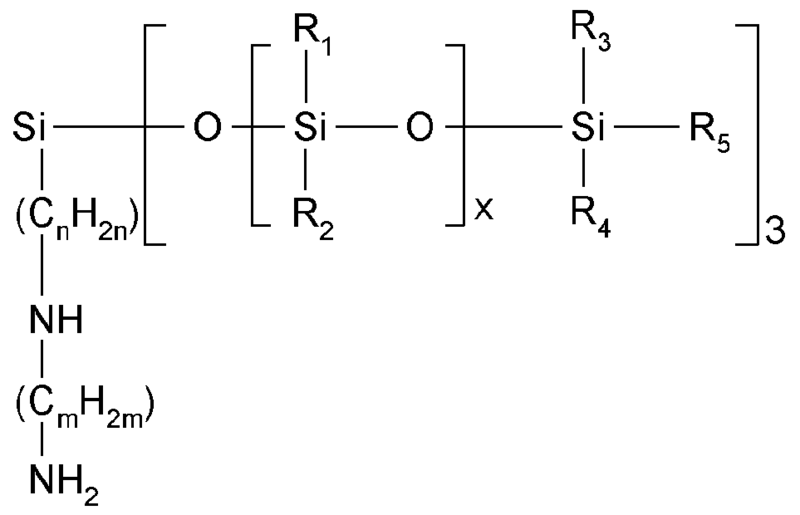 Composition comprising a non-nitrogenous zinc salt and a particular cationic surfactant The present invention relates to a cosmetic composition comprising, in a cosmetically acceptable medium, at least one particular zinc salt and at least one cationic surfactant chosen from particular quaternary ammonium salts, in a specific weight ratio. Another subject of the invention relates to a process for treating keratin fibres, using such a composition, and to the use of such a composition, preferably in the form of a leave-on care product, for conditioning keratin fibres and protecting their artificial colour from fading. The present invention relates to a cosmetic composition comprising at least one particular zinc salt and at least one particular cationic surfactant in a specific weight ratio, and also to the use of such a composition, preferably in the form of a leave-on care product, for conditioning keratin fibres and protecting their artificial colour from fading. It is known practice to dye the hair with dye compositions comprising oxidation dye precursors, which are generally known as oxidation bases. These oxidation bases are colourless or weakly coloured compounds, which, when combined with oxidizing products, give rise to coloured compounds via a process of oxidative condensation. It is also known that the shades obtained with these oxidation bases can be varied by combining them with couplers or coloration modifiers. The variety of molecules used as oxidation bases and couplers allows a wide range of colours to be obtained. It is also known practice to dye the hair by direct dyeing. The process conventionally used in direct dyeing consists in applying to the hair direct dyes, which are coloured and colouring molecules that have affinity for the hair, in leaving them to stand on the hair and then in rinsing the fibres. The colorations resulting therefrom are particularly chromatic colorations but are, however, only temporary or semi-permanent since the nature of the interactions that bind the direct dyes to the keratin fibre and their desorption from the surface and/or the core of the fibre are responsible for their weak dyeing power and their poor fastness with respect to washing. The artificial colour of the hair afforded by a direct dyeing or oxidation dyeing treatment gradually attenuates on repeated washing and exposure to light, leading over time to fading of the coloration of the hair. Besides the impairment of the artificial colours, the hair is also damaged due to repeated washing and various dyeing-bleaching treatments. In general, care products such as hair conditioners or leave-on masks or care products are used to make the hair beautiful while affording a good level of treatment. The use of cationic surfactants as conditioning agents in such care products is known. However, the formulation of zinc salts in such leave-on care products poses numerous difficulties: inter alia, the formulation of zinc salts, especially in the presence of cationic surfactants, leads to compositions that are usually unstable over time and are thus unmarketable. Thus, there is a need to find cosmetic compositions, especially in the form of a leave-on care product, which can both protect the artificial colour of the hair against the various attacking factors responsible for the fading of the colours (repeated washing, sunlight) and afford the hair a good level of care, and which are stable over time. The Applicant has discovered, surprisingly, that by formulating cosmetic compositions comprising at least one particular zinc salts and at least one particular cationic surfactant, the drawbacks mentioned above can be overcome, by obtaining compositions that are stable over time, which show satisfactory protection of the artificial colour of the hair against fading of the coloration of the hair, giving the hair good cosmetic properties, and which can be used as leave-on care products. In particular, the composition according to the invention is stable over time. In particular, it shows satisfactory stability on storage both at room temperature (25°C) and at higher temperature (for example 37 or 45°C). This means that the composition of the invention has a texture that changes little or not at all over time and in particular which does not show any syneresis effect over time. - one or more cationic surfactants defined as follows and the weight ratio of the amount of cationic surfactant(s) to the amount of zinc salt(s) being less than or equal to 1. Another subject of the present invention consists of a cosmetic process for treating keratin fibres, preferably human keratin fibres such as the hair, in which a composition according to the invention is applied to the keratin fibres and the scalp. Another subject of the present invention concerns the use of a composition according to the invention, preferably in the form of a leave-on care product such as a hair conditioner, for conditioning keratin fibres, preferably human keratin fibres such as the hair, and for protecting their artificial colour from fading. Other subjects, characteristics, aspects and advantages of the invention will emerge even more clearly on reading the description and the examples that follow. The composition according to the invention is preferably a leave-on composition, and in particular a composition preferably comprising less than 3% by weight, more preferentially less than 1% by weight and better still no anionic, nonionic, amphoteric or zwitterionic surfactants, relative to the total weight of the composition. The term "non-nitrogenous zinc salt" means any mineral or organic compound comprising in its structure at least one zinc-based cation and an anion derived from a mineral or organic acid, the said salt not comprising any nitrogen atoms in its structure. The zinc salt(s) used according to the invention are preferably chosen from water-soluble zinc salts. The term "water-soluble zinc salt" means any salt with a solubility in water of greater than or equal to 0.5% by weight, at a temperature of 25°C. The zinc salt(s) are chosen from mineral and organic zinc salts, and mixtures thereof. The term "mineral zinc salt" means any zinc salt possibly containing carbon only in the form of carbonate or hydrogen carbonate ions. Among the mineral zinc salts that may be used, examples that may be mentioned include zinc sulfate and zinc chloride, and mixtures thereof. Among the organic zinc salts that may be used, examples that may be mentioned include zinc lactate, zinc gluconate, zinc phenolsulfonate, zinc citrate and zinc salicylate, derivatives thereof, and mixtures thereof. Ri denotes a linear or branched Ci-Cis alkyl group (for example methyl, ethyl, n-propyl, isopropyl or n-butyl); a linear or branched Ci-Cig hydroxyalkyl group; a halogen atom (for example iodine, bromine or chlorine); a C2-C18 acyl group (for example acetyl); a group COR2 or OCOR2, in which R2 denotes a hydrogen atom or a linear or branched Ci-Cis alkyl group. Preferentially, zinc salt(s) are chosen from: zinc sulfate, zinc chloride, zinc lactate, zinc gluconate, zinc salicylate and zinc citrate, and mixtures thereof. Better still, the zinc salt(s) are chosen from: zinc sulfate, zinc chloride, zinc lactate and zinc gluconate, alone or as a mixture. Even more preferentially, the zinc salt is an organic zinc salt. Even more preferentially, the zinc salt is zinc lactate or zinc gluconate. Better still, the zinc salt is zinc gluconate. Zinc gluconate is sold, for example, under the name Givobio G Zn by the company SEPPIC in the composition according to the invention. The composition according to the invention preferably comprises from 0.1% to 10% by weight and in particular from 0.5% to 6.5% by weight of zinc salt(s) relative to the total weight of the composition. The concentration of zinc element is preferably less than 2% by weight, in particular ranging from 0.005% to 1.5% by weight and better still from 0.1% to 1% by weight relative to the total weight of the composition. in which the radicals Rg to Rn, which may be identical or different, represent an aromatic radical such as aryl or alkylaryl or a linear or branched aliphatic radical comprising from 1 to 30 carbon atoms, at least one of the radicals Rs to Rn comprising an alkyl or alkenyl radical comprising from 8 to 30 carbon atoms, preferably from 14 to 30 carbon atoms and better still from 16 to 25 carbon atoms, the aliphatic radicals possibly comprising heteroatoms especially such as oxygen, nitrogen, sulfur and halogens. Among the quaternary ammonium salts of formula (I), it is preferred to use alkyltrimethylammonium chlorides in which the alkyl radical comprises from about 12 to 22 carbon atoms, in particular behenyltrimethylammonium or cetyltrimethylammonium salts or oleocetyldi methyl hydroxy ethyl ammonium salts. with the proviso that the sum x + y + z is from 1 to 15, that when x is 0, then R23 denotes R27 and that when z is 0, then R25 denotes R29. 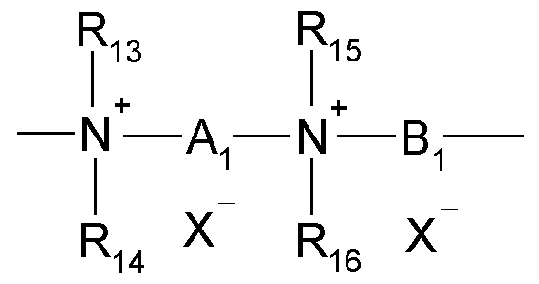 The alkyl radicals R22 may be linear or branched, but more particularly linear. R22 preferably denotes a methyl, ethyl, hydroxyethyl or dihydroxypropyl radical, and more particularly a methyl or ethyl radical. Advantageously, the sum x + y + z ranges from 1 to 10. When R23 is a hydrocarbon-based radical R27, it may be long and may contain from 12 to 22 carbon atoms, or may be short and may contain from 1 to 3 carbon atoms. When R25 is a hydrocarbon-based radical R29, it preferably contains 1 to 3 carbon atoms. C11-C21 hydrocarbon-based radicals, and more particularly from linear or branched, saturated or unsaturated C11-C21 alkyl and alkenyl radicals. Preferably, x and z, which may be identical or different, are equal to 0 or 1. The anion X" is preferably a halide (chloride, bromide or iodide) or an alkyl sulfate, more particularly methyl sulfate. It is possible, however, to use methanesulfonate, phosphate, nitrate or tosylate, an anion derived from an organic acid, such as acetate or lactate, or any other anion that is compatible with ester-functional ammonium. The anion X" is even more particularly chloride or methyl sulfate. - R24, R-26 and R28, which may be identical or different, are selected from linear or branched, saturated or unsaturated Cn-C17 hydrocarbon-based radicals, and preferably from linear or branched, saturated or unsaturated Cn-C17 alkyl and alkenyl radicals. Mention may be made, for example, of the compounds of formula (II) such as diacyloxyethyldimethylammonium, diacyloxyethylhydroxyethylmethyl ammonium, mo noacyloxy ethyl dihydroxyethylmethylammonium, triacyloxyethylmethylammonium or monoacyloxyethylhydroxyethyldimethylammonium salts (chloride or methyl sulfate, in particular), and mixtures thereof. The acyl radicals preferably contain 14 to 18 carbon atoms and are obtained more particularly from a plant oil such as palm oil or sunflower oil. When the compound contains several acyl radicals, these radicals may be identical or different. These products are obtained, for example, by direct esterification of triethanolamine, triisopropanolamine, alkyldiethanolamine or alkyldiisopropanolamine, which are optionally oxyalkylenated, with fatty acids or with fatty acid mixtures of plant or animal origin, or by transesterification of the methyl esters thereof. This esterification is followed by a quaternization by means of an alkylating agent such as an alkyl (preferably methyl or ethyl) halide, a dialkyl (preferably methyl or ethyl) sulfate, methyl methanesulfonate, methyl para-toluenesulfonate, glycol chlorohydrin or glycerol chlorohy drin. It is also possible to use the ammonium salts containing at least one ester function that are described in patents US-A-4 874 554 and US-A-4 137 180. Use may be made of behenoylhydroxypropyl trimethyl ammonium chloride sold by KAO under the name Quatarmin BTC 131. Preferably, the ammonium salts containing at least one ester function contain two ester functions. Among the quaternary ammonium salts containing at least one ester function that may be used, it is preferred to use salts of quaternary ammonium monoesters or of quaternary ammonium diesters, such as dipalmitoylethylhydroxyethylmethylammonium salts. The cationic surfactants that are particularly preferred in the composition of the invention are chosen from behenyl trimethylammonium chloride, oleocetyldimethylhydroxy ethylammonium chloride, cetyltrimethylammonium chloride and dip almitoylethylhydroxy ethyl methyl ammonium salts. The cationic surfactant(s) that may be used according to the invention are present in contents ranging from 0.01% to 5% by weight, in particular from 0.02% to 3% by weight and better still from 0.03% to 2% by weight, with respect to the total weight of the composition. The weight ratio of the amount of cationic surfactant(s) to the amount of zinc salt(s) is less than or equal to 1, preferably from 0.005 to 1 and more preferentially from 0.01 to 1. The weight ratio of the amount of cationic surfactant(s) to the amount of zinc salt(s) is preferably from 0.005 to 10, better still from 001 to 10 and better still from 0 1 to 2. The composition according to the invention may also comprise one or more fatty alcohols. For the purposes of the present invention, the term "fatty alcohol" means any saturated or unsaturated, linear or branched pure fatty alcohol comprising at least 8 carbon atoms and not comprising any oxyalkylene or glycerol groups. The fatty alcohol may have the structure R-OH in which R denotes a saturated or unsaturated, linear or branched radical containing from 8 to 40 and preferably from 8 to 30 carbon atoms; R preferably denotes a C12-C24 alkyl or C12-C24 alkenyl group. 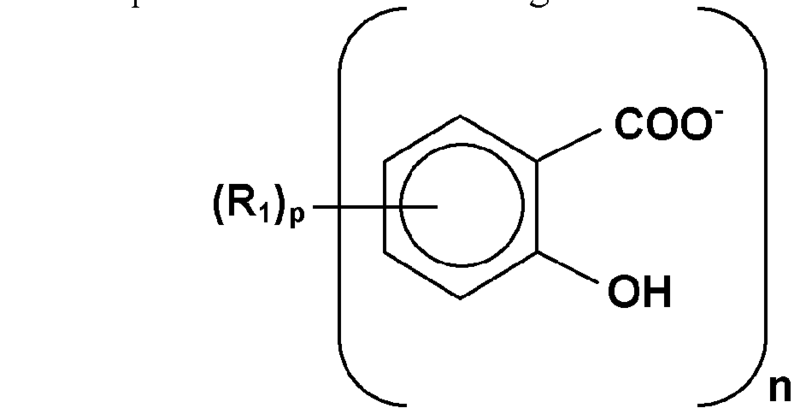 R may be substituted with one or more hydroxyl groups. 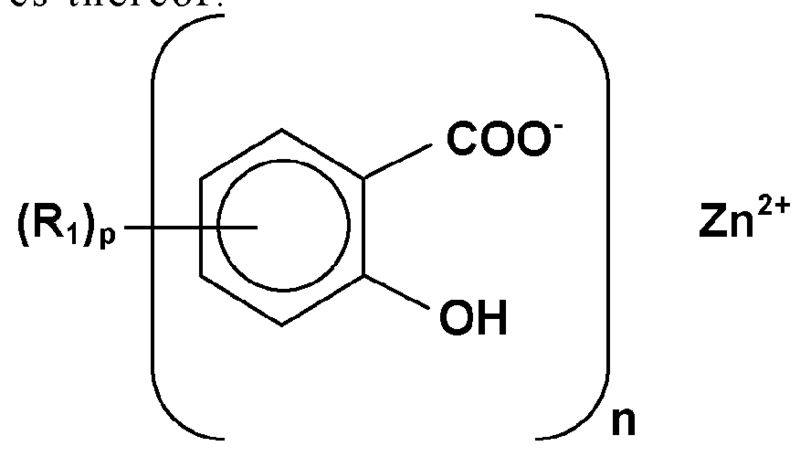 Examples of fatty alcohols that may be mentioned include lauryl alcohol, myristyl alcohol, cetyl alcohol, dodecyl alcohol, decyl alcohol, stearyl alcohol, oleyl alcohol, behenyl alcohol, linoleyl alcohol, undecylenyl alcohol, palmitoleyl alcohol, arachidonyl alcohol and erucyl alcohol, and mixtures thereof. The fatty alcohol may represent a mixture of fatty alcohols, which means that several species of fatty alcohol may coexist, in the form of a mixture, in a commercial product. Fatty alcohol mixtures that may be mentioned include cetylstearyl alcohol and cetearyl alcohol. Among all the fatty alcohols that may be used according to the invention, use is preferably made of one or more fatty alcohols chosen from cetyl alcohol, stearyl alcohol and myristyl alcohol. When they are present, the composition according to the invention preferably comprises from 0.1% to 10% by weight and better still from 1% to 5% by weight of fatty alcohol(s) relative to the total weight of the composition. The composition according to the invention may also comprise one or more esters of a fatty alcohol and/or of a fatty acid. As esters of fatty alcohols and/or of fatty acids that may be used, mention may be made of esters derived from the esterification reaction of a fatty alcohol as defined above and/or of a fatty acid as defined below. For the purposes of the present invention, the term "fatty acid" means any saturated or unsaturated, linear or branched pure carboxylic acid comprising at least 8 carbon atoms and not comprising any oxyalkylene or glycerol groups. Examples of fatty acids that may be mentioned include lauric acid, oleic acid, palmitic acid and stearic acid. Among all the esters of fatty alcohols and/or of fatty acids that may be used according to the invention, it is preferred to use the cetyl ester or the stearyl ester, and better still a mixture thereof, as sold, for example, under the name Crodamol MS-Pa by the company Croda. When they are present, the composition according to the invention may preferably comprise from 0.01% to 8% by weight and better still from 0.5% to 5% by weight of fatty alcohol and/or fatty acid ester(s) relative to the total weight of the composition. The composition according to the invention may also comprise one or more non-silicone cationic polymers. The cationic polymer(s) that may be used in accordance with the present invention may be selected from all of those already known per se to enhance the cosmetic properties of hair treated with detergent compositions, these being, in particular, the polymers described in patent application EP-A-0337354 and in French patent applications FR-A-2270846, FR-A-2383 660, FR-A-2598611, FR- A-2470596, FR-A-2519863 and FR-A-2875 503. The preferred cationic polymer(s) are chosen from those that contain in their structure units comprising primary, secondary, tertiary and/or quaternary amine groups that may either form part of the main polymer chain or may be borne by a side substituent directly attached thereto. X" denotes an anion derived from a mineral or organic acid, such as a methosulfate anion or a halide such as chloride or bromide. quaternized or non-quaternized vinylpyrrolidone/ dialkylaminoalkyl acrylate or methacrylate copolymers, such as the products sold under the name Gafquat by the company ISP, such as, for example, Gafquat 734 or Gafquat 755 (Polyquaternium-11), or alternatively the products known as Copolymer 845, 958 and 937. These polymers are described in detail in French patents 2077 143 and 2393 573. Polyquaternium- 11 is preferably used. - the crosslinked polymers of methacryloyloxy(Ci-C4)alkyl tri(Ci-C4)alkylammonium salts, such as the polymers obtained by homopolymerization of dimethylaminoethyl methacrylate quaternized with methyl chloride, or by copolymerization of acrylamide with dimethylaminoethyl methacrylate quaternized with methyl chloride, the homo- or copolymerization being followed by crosslinking with an olefinically unsaturated compound, more particularly methylene bisacrylamide. 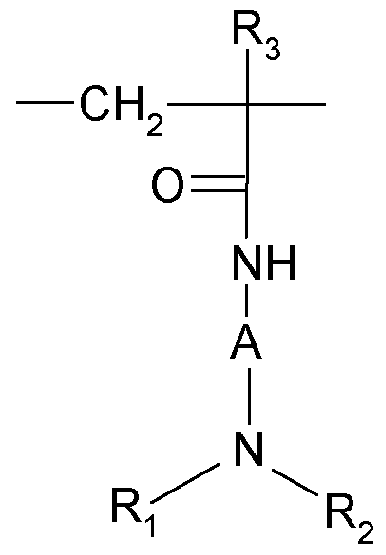 A crosslinked acrylamide/methacryloyloxyethyl- trimethylammonium chloride copolymer (20/80 by weight) in the form of a dispersion containing 50% by weight of the said copolymer in mineral oil can be used more particularly. This dispersion is sold under the name Salcare® SC 92 by the company Ciba. Use may also be made of a crosslinked homopolymer of methacryloyloxyethyl trimethylammonium chloride containing approximately 50% by weight of the homopolymer in mineral oil or in a liquid ester. These dispersions are sold under the names Salcare® SC 95 and Salcare® SC 96 by the company Ciba. a) cellulose ether derivatives comprising quaternary ammonium groups described in French patent 1 492 597, and in particular the polymers sold under the names "JR" (JR 400, JR 125, JR 30M) or "LR" (LR 400, LR 30M) by the company Union Carbide Corporation. b) cellulose copolymers or cellulose derivatives grafted with a water-soluble quaternary ammonium monomer, such as hydroxyalkyl celluloses, for instance hydroxymethyl, hydroxyethyl or hydroxypropyl celluloses grafted especially with a methacryloylethyltrimethyl- ammonium, methacrylamidopropyltrimethylammonium or dimethyl- diallylammonium salt. The commercial products corresponding to this definition are more particularly the products, corresponding to the INCI name Polyquaternium-4, sold under the names Celquat L 200 and Celquat H 100 by the company National Starch or Celquat LOR by the company Akzo Nobel. c) guar gums containing trialkylammonium cationic groups. Use is made, for example, of guar gums modified with a 2,3- epoxypropyltrimethylammonium salt (for example, chloride). Such products are sold in particular under the trade names Jaguar C13 S, Jaguar C 15, Jaguar C 17 or Jaguar C162 by the company Meyhall. (3) Polymers formed from piperazinyl units and divalent alkylene or hydroxyalkylene radicals containing straight or branched chains, optionally interrupted with oxygen, sulfur or nitrogen atoms or with aromatic or heterocyclic rings, and also the oxidation and/or quaternization products of these polymers. Such polymers are described, in particular, in French patents 2 162025 and 2280361. (4) Water-soluble cationic polyaminoamides, prepared in particular by polycondensation of an acid compound with a polyamine; these polyaminoamides may be crosslinked with an epihalohydrin, a diepoxide, a saturated dianhydride, an unsaturated dianhydride, a bis- unsaturated derivative, a bis-halohydrin, a bis-azetidinium, a bis- haloacyldiamine or a bis-alkyl halide or else by an oligomer resulting from the reaction of a bifunctional compound which is reactive towards a bis-halohydrin, a bis-azetidinium, a bis-haloacyldiamine, a bis-alkyl halide, an epihalohydrin, a diepoxide or a bis-unsaturated derivative; these polyaminoamides may be alkylated, or quaternized if they contain one or more tertiary amine functions. Such polymers are described, in particular, in French patents 2252840 and 2368 508. (5) Polyamino amide derivatives resulting from the condensation of polyalkylene polyamines with polycarboxylic acids followed by alkylation with difunctional agents. Mention may be made, for example, of adipic acid/dialkylaminohydroxy- alkyldialkylenetriamine polymers in which the alkyl radical comprises from 1 to 4 carbon atoms and preferably denotes methyl, ethyl or propyl. Such polymers are especially described in French patent 1 583 363. Among these derivatives, mention may be made more particularly of the adipic acid/dimethylaminohydroxy- propyl/diethylenetriamine polymers sold under the name Cartaretine F, F4 or F8 by the company Sandoz. (6) Polymers obtained by reaction of a polyalkylene polyamine containing two primary amine groups and at least one secondary amine group with a dicarboxylic acid chosen from diglycolic acid and saturated aliphatic dicarboxylic acids having from 3 to 6 carbon atoms. The mole ratio between the polyalkylene polyamine and the dicarboxylic acid is between 0.8: 1 and 1.4: 1; the polyaminoamide resulting therefrom is reacted with epichlorohydrin in a molar ratio of epichlorohydrin relative to the secondary amine group of the polyaminoamide of between 0.5: 1 and 1.8: 1. Such polymers are described in particular in US patents 3 227615 and 2961 347. Polymers of this type are sold in particular under the name Hercosett 57 by the company Hercules Inc. or alternatively under the name PD 170 or Delsette 101 by the company Hercules in the case of the adipic acid/epoxypropyl/diethylenetriamine copolymer. (VII) (VIII) in which formulae: k and t are equal to 0 or 1, the sum k + t being equal to 1; R12 denotes a hydrogen atom or a methyl group; Rio and Rn, independently of one another, denote an alkyl group having from 1 to 6 carbon atoms, a hydroxyalkyl group in which the alkyl group has preferably 1 to 5 carbon atoms, a lower (C1-C4) amidoalkyl group, or else Rio and Rn may, together with the nitrogen atom to which they are attached, denote a heterocyclic group, such as piperidyl or morpholinyl; Y" is an anion such as bromide, chloride, acetate, borate, citrate, tartrate, bisulfate, bisulfite, sulfate or phosphate. These polymers are especially described in French patent 2080759 and in its Certificate of Addition 2 190406. Rio and Rn, independently of one another, preferably denote an alkyl group containing from 1 to 4 carbon atoms. Among the polymers defined above, mention may be made of dialkyldiallylammonium chloride homopolymers, more particularly dimethyldiallylammonium chloride homopolymer (INCI name: Polyquaternium-6) sold, for example, under the name Merquat® 100 by the company Nalco (and homologues thereof of low weight-average molecular masses) and dialkyldiallylammonium chloride homopolymers, more particularly the copolymer of dimethyldiallylammonium chloride and of acrylamide sold under the name Merquat® 550.
d) a ureylene group of formula -NH-CO-NH-. Preferably, X" is an anion such as chloride or bromide. Polymers of this type are described in particular in French patents 2320330, 2270846, 2316271, 2336434 and 2413 907 and US patents 2273 780, 2375 853, 2388614, 2454547, 3 206462, 2261 002, 2271 378, 3 874870, 4001 432, 3 929990, 3 966904, 4005 193, 4025 617, 4025 627, 4025 653, 4026945 and 4027020.
in which Rn, 14, R15 and Ri6, which are identical or different, denote an alkyl or hydroxyalkyl group having from 1 to 4 carbon atoms approximately, n and p are integers ranging from 2 to 8 approximately, and X" is an anion derived from a mineral or organic acid. Preferably, R , R14, R15 and Ri6 each denote a methyl group. As an example of a polymer that may be used corresponding to formula (X), mention may be made of hexadimethrine chloride, sold under the name Mexomer PO by the company Chimex. X" is an anion derived from a mineral or organic acid. Cationic polymers comprising units of formula (XI) are especially described in patent application EP-A-122 324 and may be prepared according to the processes describ ed in US patents 4 157 388, 4 390 689, 4 702 906 and 4 719 282.
d) a "block copolymer" formed from units corresponding to the polymers described in paragraphs a) and c), sold by the company Miranol under the names Mirapol-9 (1 C NMR molecular mass of about 7800), Mirapol- 175 (13C NMR molecular mass of about 8000) and Mirapol-95 (1 C NMR molecular mass of about 12 500). Even more particularly, the polymer containing units of formula (XI) in which p i s equal to 3 , D denotes the value zero and X denotes a chlorine atom, the molecular mass measured by carbon- 1 3 NMR (13C NMR) being about 25 500, i s preferred according to the invention. Luviquat FC 905, FC 550 and FC 370 by the company BASF . H2C=CR2NRC(0)R1 in which R, R1 and R2 are each chosen from a hydrogen atom, a C1-C20 alkyl group, an aryl group and an alkylaryl group in which the alkyl part comprises from 1 to 20 carbon atoms. In particular, the said monomer may be chosen from N- vinylformamide, N-methyl-N-vinylacetamide and N-vinylacetamide. Preferably, poly(vinylamine/N-vinylformamide) is used, as sold under the name Catiofast VMP by the company BASF or under the name Lupamin 9030 by the company BASF. These polymers may be formed, for example, by radical polymerization of a vinylamide monomer followed by partial acidic or basic hydrolysis of the amide functions to quaternizable amine functions, as described in patent applications WO 2007/005 577, US 5 374334, US 6426383 and US 6894 110. (b) at least one isophorone diisocyanate (noted IPDI). Preferably, the amines forming the cationic units (al) represent from 0.1% to 50%, in particular from 1% to 30% and better still from 5% to 20% by weight relative to the total weight of the final polyurethane. These polyurethanes and the syntheses thereof are described, for example, in patent application FR-A-2898603. (14) Other cationic polymers that may be used in the context of the invention are cationic proteins or cationic protein hydrolysates, polyalkyleneimines, in particular polyethyleneimines, polymers containing vinylpyridine or vinylpyridinium units, and chitin derivatives. Among all the cationic polymers that may be used in the context of the present invention, it is preferred to use a copolymer of hydroxyethylcellulose and of diallyldimethylammonium chloride (Polyquaternium-4) or Polyquaternium- 11 in the composition according to the invention. When they are present, the composition according to the invention may comprise from 0.001% to 5% by weight and in particular from 0.01% to 2% by weight of cationic polymer(s) relative to the total weight of the composition. The composition according to the invention may also comprise one or more silicones, preferably amino silicones. For the purposes of the present invention, the term "amino silicone" means any silicone comprising at least one primary, secondary or tertiary amine function or a quaternary ammonium group. in which R2 denotes a hydrogen atom, a phenyl, a benzyl or a saturated monovalent hydrocarbon-based radical, for example a C1-C20 alkyl radical, and Q" represents a halide ion, for instance fluoride, chloride, bromide or iodide. (XIII) in which R, R' and R", which may be identical or different, denote a C1-C4 alkyl radical, preferably CH3; a C1-C4 alkoxy radical, preferably methoxy; or OH; A represents a linear or branched, C3-C8 and preferably C3-C6 alkylene radical; m and n are integers dependent on the molecular weight and whose sum is between 1 and 2000. According to a first possibility, R, R' and R", which may be identical or different, represent a C1-C4 alkyl or hydroxyl radical, A represents a C3 alkylene radical and m and n are such that the weight- average molecular mass of the compound is between 5000 and 500000 approximately. Compounds of this type are referred to in the CTFA dictionary as "amodimethicones". According to a second possibility, R, R' and R", which may be identical or different, represent a C1-C4 alkoxy or hydroxyl radical, at least one of the radicals R or R" is an alkoxy radical and A represents a C3 alkylene radical. The hydroxy/alkoxy molar ratio is preferably between 0.2/1 and 0.4/1 and advantageously equal to 0.3/1. Moreover, m and n are such that the weight-average molecular mass of the compound is between 2000 and 106. More particularly, n is between 0 and 999 and m is between 1 and 1000, the sum of n and m being between 1 and 1000. In this category of compounds, mention may be made, inter alia, of the product Belsil® ADM 652 sold by Wacker. According to a third possibility, R and R", which are different, represent a C1-C4 alkoxy or hydroxyl radical, at least one of the radicals R or R" is an alkoxy radical, R' represents a methyl radical and A represents a C3 alkylene radical. The hydroxy/alkoxy molar ratio is preferably between 1/0.8 and 1/1.1 and advantageously is equal to 1/0.95. Moreover, m and n are such that the weight-average molecular weight of the compound is between 2000 and 200000. More particularly, n is between 0 and 999 and m is between 1 and 1000, the sum of n and m being between 1 and 1000. More particularly, mention may be made of the product Fluid WR® 1300 sold by Wacker. According to a fourth possibility, R and R" represent a hydroxyl radical, R' represents a methyl radical and A is a C4-C8 and preferably C4 alkylene radical. Moreover, m and n are such that the weight-average molecular mass of the compound is between 2000 and 106. More particularly, n is between 0 and 1999 and m is between 1 and 2000, the sum of n and m being between 1 and 2000. A product of this type is especially sold under the name DC 28299 by Dow Corning. It should be noted that the molecular weight of these silicones is determined by gel permeation chromatography (room temperature, polystyrene standard; μ styragem columns; THF eluent; flow rate of 1 mm/m; 200 μΐ of a solution containing 0.5% by weight of silicone in THF are injected, and detection is performed by refractometry and UV-metry). Such compounds are described, for example, in patent EP 95238; a compound of formula (XIV) is sold, for example, under the name Q2-8220 by the company OSI. s represents a mean statistical value from 20 to 200 and in particular from 20 to 50. Such compounds are described more particularly in patent US 4 1 85 087. A compound falling within this class i s the product sold by the company Union Carbide under the name Ucar Silicone ALE 56. 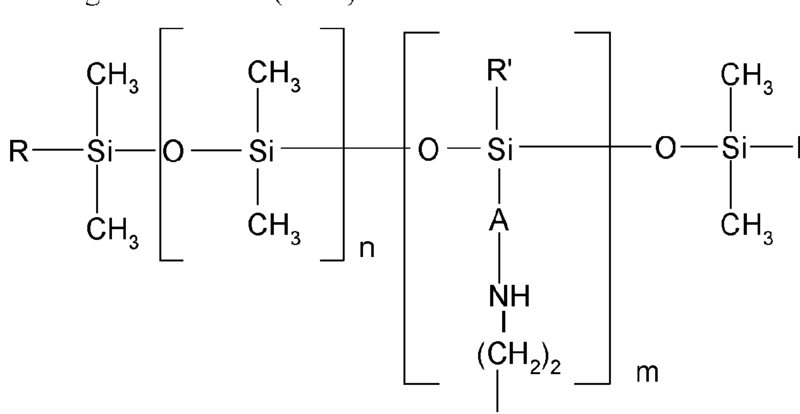 These silicones are described, for example, in patent application EP-A-0530974. and in which x is selected such that the amine number is between 0.01 and 1 meq/g. The silicone that is particularly preferred is amodimethicone. When they are present, the composition according to the invention may preferably comprise from 0.01% to 10% by weight and better still from 0.1% to 1.5% by weight of silicone(s) relative to the total weight of the composition. The composition according to the invention may moreover comprise one or more cosmetic additives commonly used in the art, for instance antioxidants, organic ultraviolet screening agents, inorganic ultraviolet screening agents, thickeners, softeners, antifoams, moisturizers, emollients, plasticizers, mineral fillers, clays, mineral colloids, nacres, fragrances, peptizers, preserving agents, fixing or non-fixing polymers, proteins and vitamins, and mixtures of these compounds. A person skilled in the art will take care to select the optional additives and the amounts thereof so that they do not interfere with the properties of the compositions of the present invention. When they are present, these additives may represent an amount ranging from 0.001% to 90% by weight, preferably from 0.001% to 50% by weight and better still from 0.001% to 20% by weight, relative to the total weight of the composition according to the invention. The composition according to the invention generally comprises water or a mixture of water and one or more organic solvents. (C1-C4), such as ethanol, isopropanol, tert-butanol or n-butanol; polyols such as propylene glycol and glycerol; polyol ethers; C5-C10 alkanes; C3-C4 ketones such as acetone; C1-C4 alkyl acetates such as methyl acetate, ethyl acetate and butyl acetate; dimethoxyethane and diethoxy ethane; and mixtures thereof. When the composition according to the invention comprises one or more organic solvents, these solvents may be present in a proportion of from 0.1% to 30% by weight and preferably 0.1% to 10% by weight relative to the total weight of the composition. The pH of the composition according to the invention, if it is aqueous, generally ranges from 1.5 to 11, preferably from 2 to 65 and better still from 2 to 5. It may be adjusted to the desired value by means of acidifying or basifying agents usually used in the dyeing of keratin fibres, or alternatively using standard buffer systems. Among the acidifying agents, examples that may be mentioned include mineral or organic acids, for instance hydrochloric acid, orthophosphoric acid, sulfuric acid and sulfonic acids, and carboxylic acids, for instance acetic acid, tartaric acid, citric acid or lactic acid. Ra, Rb, Rc and Rd, which may be identical or different, represent a hydrogen atom or a C1-C4 alkyl or C1-C4 hydroxyalkyl group. The composition according to the invention may be in any galenical form normally used for topical application. In particular, the composition according to the invention may be a lotion, a gel, a spray, a mousse or a cream. The composition according to the invention may be a shampoo, a hair conditioner, a hairsetting product, a dye product, a bleaching product or a permanent-waving product. Preferably, the composition according to the invention is a hair conditioner. Another subject of the invention is a cosmetic treatment process that comprises the application to keratin fibres, preferably human keratin fibres such as the hair, and the scalp, of a composition according to the invention as described above, with or without and preferably without subsequent rinsing of the said keratin fibres. The composition according to the invention that is applied may be massaged on the hair so as to accelerate the penetration, by hand or using any other adequate means, such as a brush or a comb. The examples which follow are intended to illustrate the invention without, however, being limiting in nature. The amounts are indicated as weight percentages of active materi al (AM) rel ative to the total weight of each composition. The weight ratio of the amount of cationi c surfactant(s) to the amount of zinc salt(s) (noted R) and the weight ratio of the amount of cationi c surfactant(s) to the amount of zinc element(s) (noted R') were cal cul ated for each composition. Compositions 1 to 4 according to the invention, applied the form of rinse-out hair conditioners, give the hair very gc smoothness, suppleness and sheen properties. Compositions 5 and 6 according to the invention, applied in the form of leave-on compositions, give the hair very good smoothness, suppleness and sheen properties. the weight ratio of the amount of cationic surfactant(s) to the amount of zinc salt(s) being less than or equal to 1. 2. Composition according to Claim 1, characterized in that the zinc salt(s) are chosen from water-soluble mineral or organic zinc salts, and mixtures thereof. 3. Composition according to Claim 1 or 2, characterized in that the zinc salt(s) are chosen from mineral salts and in particular from zinc sulfate and zinc chloride. Ri denotes a linear or branched d-C18 alkyl group (for example methyl, ethyl, n-propyl, isopropyl or n-butyl); a linear or branched Ci-Cis hydroxyalkyl group; a C2-C18 acyl group (for example acetyl); a group COR2 or OCOR2, in which R2 denotes a hydrogen atom or a linear or branched Ci-Cis alkyl group. 5. Composition according to any one of Claims 1 to 4, characterized in that the zinc salt is zinc lactate or zinc gluconate, and preferably the zinc salt is zinc gluconate. 6. Composition according to any one of the preceding claims, characterized in that the concentration of zinc salt(s) ranges from 0.1% to 10% by weight and preferably from 0.5% to 6.5% by weight relative to the total weight of the composition. 7. Composition according to any one of the preceding claims, characterized in that the concentration of zinc element is less than 2% by weight, and in particular ranges from 0.005% to 1.5% by weight and better still from 0.1% to 1% by weight relative to the total weight of the composition. 8. Composition according to any one of the preceding claims, characterized in that the cationic surfactant(s) are chosen from behenyl trim ethyl ammonium chloride, oleocetyldi methyl hydroxy ethyl ammonium chloride, cetyltrimethylammonium chloride and the dip almitoylethylhydroxy ethyl methyl ammonium salt. 9. 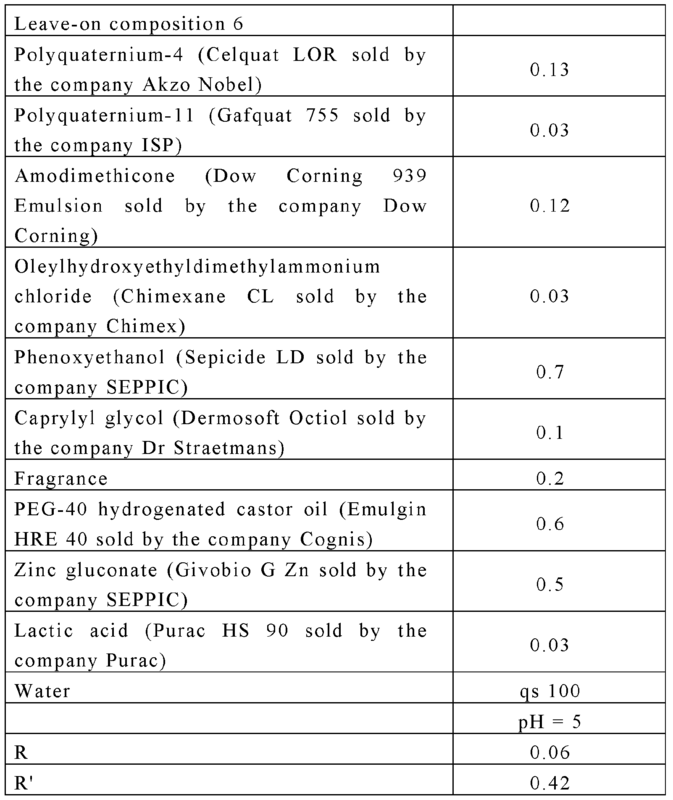 Composition according to any one of the preceding claims, characterized in that the concentration of cationic surfactant(s) ranges from 0.01% to 5% by weight, preferably from 0.02% to 3% by weight and better still from 0.03% to 2% by weight relative to the total weight of the composition. 10. Composition according to any one of the preceding claims, characterized in that it comprises less than 3% by weight of anionic, nonionic, amphoteric or zwitterionic surfactants relative to the total weight of the composition. 11. 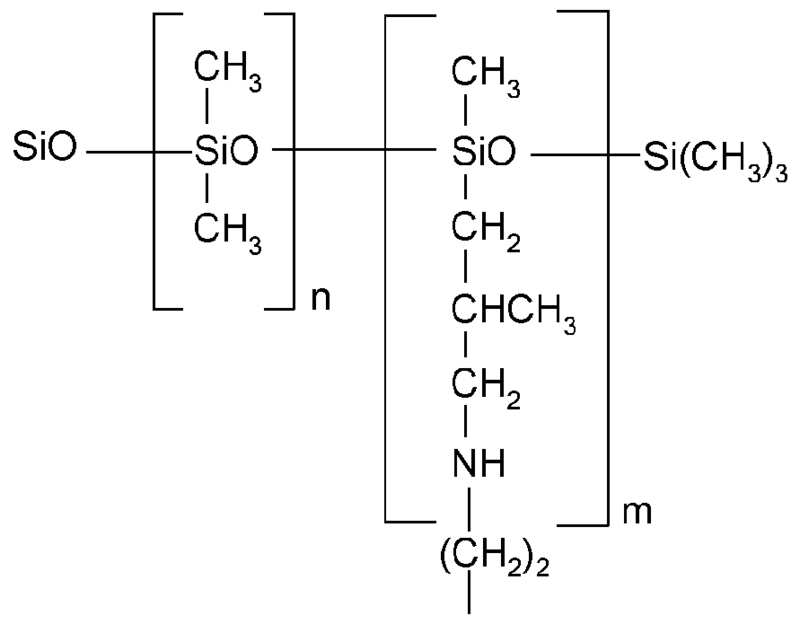 Composition according to any one of the preceding claims, characterized in that it comprises one or more fatty alcohols and/or one or more esters of a fatty alcohol and/or of a fatty acid, and/or one or more non-silicone cationic polymers, and/or one or more silicones, preferably amino silicones. 12. Composition according to any one of the preceding claims, characterized in that the weight ratio of the amount of cationic surfactant(s) to the amount of zinc salt(s) ranges from 0.005 to 1, and preferably from 0.01 to 1. 13. Cosmetic process for treating keratin fibres, characterized in that a composition as defined according to any one of Claims 1 to 12 is applied to keratin fibres and the scalp, with or without and preferably without subsequent rinsing. 14. Use of a composition as defined in any one of Claims 1 to 12 for conditioning keratin fibres and protecting their artificial colour from fading. 15. Use according to Claim 14 of a composition as defined according to any one of Claims 1 to 12 as a hair conditioner. CH657523A5 (en) 1986-09-15 COSMETIC COMPOSITION treating keratin fibers and processing method thereof.